The Mekong delta province of Dong Thap takes the lead in labor export in the region. At present, the province has more than 4,000 people to work abroad who send VND1,200 billion home annually. In 2017, around 1,700 local workers signed contracts to work in foreign countries. Farmer Nguyen Ngoc Thuan in Hoa Long Commune in Lai Vung District spent 6 years to work overseas. Thanks to all efforts of the provincial authorities, Dong Thap has been the top labor supplier for other countries including Japan and South Korea in recent years. In late 2014, the province’s government defined labor export as a key mission, aiming to reduce poverty and improve the quality of life, said Secretary of Provincial Party Committee, Le Minh Hoan. The authorities in Dong Thap offered local labor force policies and advantages, including loans, free language lessons and job consultancy, financial support for health check-ups, and others. The labor export program also aims to create a skilled human resource offering competent workforces for the modernization and industrialization in the province, added Mr. Le Minh Hoan. Leaders of the province have travelled to Japan and Korea to learn about the labor market demand and had working sessions with representatives of enterprises on sending workers abroad. The province also has focused on providing vocational training supports for rural laborers, aiming at building a brand name of its laborers to promote labor export, said Chairman of the provincial People’s Committee Nguyen Van Duong. 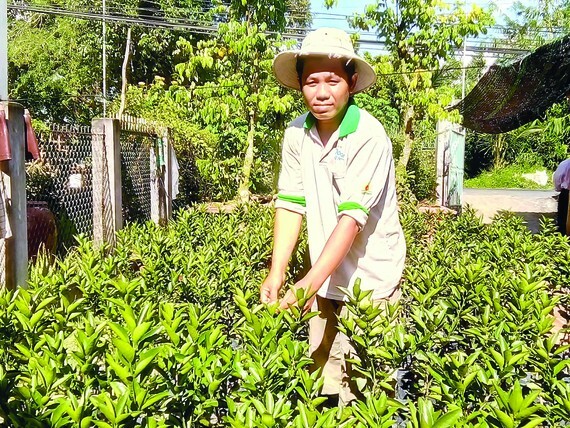 Farmer Nguyen Ngoc Thuan in Hoa Long Commune in Lai Vung District spent 6 years to work overseas with an average salary of VND25 million (US$1,100) per month. After coming back home, he started a business with a a shop of agricultural products and fruit gardens. Meanwhile farmer Doan Van Viet in My Tho commune in Cao Lanh District said his son is working in Japan with an average salary from VND25-30 million (US$1,100-US$ 1,300). Another example is Le Nhut Truong, a resident in Tinh Thoi commune in Cao Lanh City. He graduated from the Faculty of Mechatronics of Can Tho University and then studied Japanese language to travel to Japan for working in 2014. After three years of hard work in mechanical company, he saved a large sum of more than VND1 billion (US$ 44,000). Chairman of the People’s Committee of Lai Vung District, Ho Van Phuong said, more than 200 locals work abroad, mainly in the Japanese market with an average income of VND25 million-VND30 million per month. Labor export helps create jobs and improve living standards for many people. It has also contributed in easing the country's growing burden of unemployment, as well as alleviate poverty. In some villages which has high rate of labor exports, many people leave poverty behind to become rich.